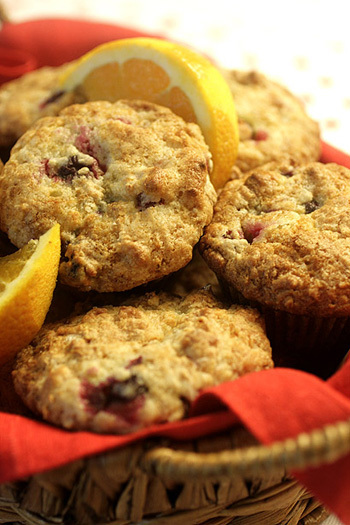 Sweet oranges and tart cranberries are a pretty pair! I always keep a bag of cranberries in my freezer year-round since they disappear from the produce isle after the winter holidays. Heat oven to 350°F. 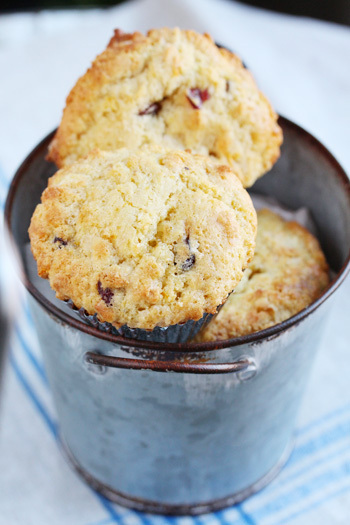 Grease and flour a 12-cup muffin tin or line with paper liners. In a large bowl mix flour, protein powder, baking powder, and baking soda. Set aside. In a medium bowl, beat butter and sugar, with a wooden spoon, until well combined. Stir in buttermilk, orange zest and juice, eggs, and cranberries - the mixture will look broken. Add the flour mixture. Mix batter until it just comes together about 10 to 15 turns; do not over mix, or the muffins will be tough. Fill muffin papers to the edge. Bake for 12 to 15 minutes or until muffins spring back to the touch. Transfer to a wire rack to cool. Cool completely before storing in an air-tight container for up to 3 week. Nutritional Stats Per Serving (1 muffin): 181 calories, 7 g protein, 19 g carbohydrates, 9 g fat (5 g saturated), 51 mg cholesterol, 2 g fiber, 116 mg sodium.